I can imagine an argument breaking out behind the closed doors of a GM meeting room in Detroit a few years ago. Not the fancy meeting room at the top of the Renaissance Center Tower mind you, that’s reserved for executives to watch the Detroit Grand Prix or chill with Netflix on their lunch break. No, this meeting, as we imagine it, was among a group of engineers and designers at a lower level, maybe even the basement, if the Renaissance Tower has such a thing. 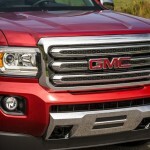 The discussion was centered on the reintroduction of the GMC Canyon. 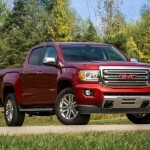 Because for a few years, the world had somehow soldiered on despite a lack of a midsize pickup truck from GMC. 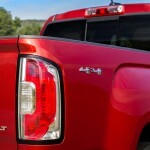 From 2012 to 2014 there were no midsize pickup models offered by the upscale GM badge. However, for 2015, a new Canyon was brought back; the angels sang, the clouds parted and the sun shone once again. Which leads us back to that imagined argument. That group of engineers and designers all had ideas as to what the new Canyon should be. 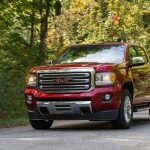 Long bed, short bed, crew cab, extended cab, 2.5 4-cylinder, 3.6 6-cylinder engine, 2-wheel, 4-wheel drive, and so on. Since there was obviously no strong leadership among this group, (someone to shout “enough”) here’s what we have. We ended up with two engine choices, two bed and cab sizes, and SLE, SLT, All-Terrain, or something. It was a compromise among all those in attendance. 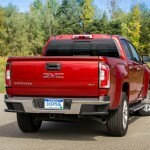 Yes the Canyon is a good midsize truck. We spent a week with the reintroduced model last year and liked it, liked very much. A few weeks prior to that we had the full size Silverado. That too was nice, but it was big. It was ungainly on the road, and in a parking lot, well you never wanted to try to park near anyone else. The Canyon though was easier to drive and park, and unless you were a full time construction worker or lumberjack that needed a big truck for work, the Canyon is a good choice for those who need to haul stuff or tow things on occasion. It’s just that there are so many choices it’s hard to figure out exactly which one to get. During the last year however we can imagine that one of those original engineers or designers had a moment of realization. A moment when one of them thought, ‘wait we forgot something’. 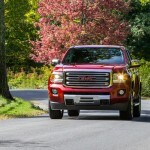 So for 2016 GMC added yet another choice for its Canyon: a turbocharged 2.8-liter four-cylinder diesel engine. And that’s probably one of the best things they could have done. 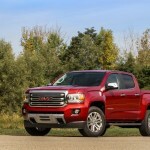 The GMC Canyon is a midsize pickup available in two- and four-seat extended-cab and five-seat crew cab styles. There are two bed lengths (5.2 and 6.2) and four trim levels: SL, base Canyon, SLE and SLT. Still with us? Good because you’ll need to pay attention to keep up with the following: The entry level SL can only be had with the extended cab. You get a lot of standard features, AC, power accessories including four way power seats, daytime running lights, vinyl upholstery, a rearview camera and a six-speaker AM/FM audio system with a 4.2-inch color display and 16-inch alloy wheels. Moving up, the next level is the Canyon, which is the actually the base Canyon. Why it isn’t the first level, well imagine that meeting. 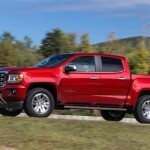 Anyway, the base Canyon can be had in both extended-cab and crew cab body styles, and adds rear jump seats that can fold-up, but only in the extended-cab models. The upholstery is also cloth. With the base Canyon you can add such options as the Convenience package which gets you an EZ-Lift tailgate, remote keyless entry, and cruise control among other things. You can upgrade the audio system of the base Canyon, that adds Bluetooth, GMC’s app-based IntelliLink system, Pandora Internet radio and OnStar telematics with 4G LTE WiFi hotspot capabilities. Other add-ons include a spray on protection for the bed liner, an automatic locking rear differential, and a trailering package, but only if you get the V6 or diesel engine. The next level, the SLE includes the Convenience package and adds power side mirrors, overhead console, upgraded interior trim, OnStar with the 4G LTE WiFi and an upgraded version of the IntelliLink interface with an 8-inch touchscreen. 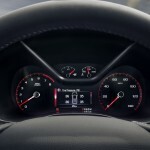 There is also satellite radio, voice and steering wheel controls and four USB ports. The SLE options include the SLE Convenience package with automatic climate control, remote ignition and a sliding rear window. There is also the All-Terrain package (think Colorado Z71), with all-terrain tires, suspension tuned for off-road, hill descent control, rear locking differential, heated front seats, on top of 17 inch dark tinted alloy wheels. SLT is the top of the line. It adds all the SLE standard equipment and adds its own Convenience package. There is more chrome, leather upholstery, and it comes with 18-inch wheels. The SLE and SLT can add the optional Driver Alert package with frontal collision warning and lane departure warning systems as well as an upgraded seven-speaker Bose audio system and a navigation system. 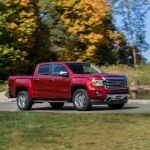 The 2.8 liter Duramax turbocharged engine is an option with a $3730 price tag but can only be had on the crew cab. The standard engine under the hood is a 2.5 liter 4-cylinder powerplant that emits 200 hp and 191 lb-ft of torque. A six speed manual shifter is standard on the SL and extended-cab base Canyon. The other available bas power engine is a 3.6-liter V6 with 305 hp and 269 lb-ft and delivers power to the road via a six-speed automatic. 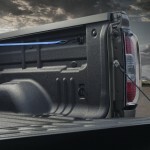 Towing capacity for a properly equipped 4-cylinder is 3500 pounds, for the properly equipped V6, 7000 pounds. The new for this year Duramax diesel, belts out only 181 horses. 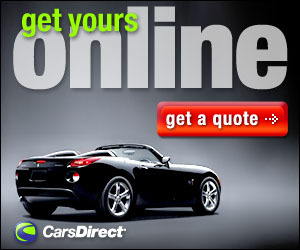 But the real story is the 369 pound-feet of torque which far exceeds the gasoline power. For towing or hauling loads, the diesel can tow 7700 pounds. The fuel mileage for the diesel is also a tick better than the others: up to 27 highway on the gasoline models, 29 highway for the Duramax. For our week, we had the SLT crew cab short box, 4WD with the upgraded sound system, trailering add-ons, 8-inch screen, and the Driver Alert package. Our tester topped out with an MSRP of $44,365 including a $925 destination charge and the $3730 cost of the diesel. 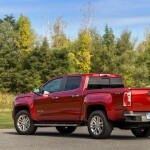 That MSRP might seem a bit much, but truth be told, in our opinion, if we were looking for a pickup truck and didn’t build things or chop down trees, the GMC Canyon would be at the top of our list, especially with the new diesel. After a week with this new Canyon, we found it easy to drive around town. The diesel was very capable for everyday use, the interior roomy and pleasant looking and the drive nice as well as smooth. We were left with little doubt there is little this truck can’t do. Like our week with the model last year, this one was just as good. Our only complaint is the confusion over the levels, options and add-ons that can leave a potential buyer scratching their head. The engineers and designers need to get together and do a bit of trimming. Give us fewer choices and less confusion. 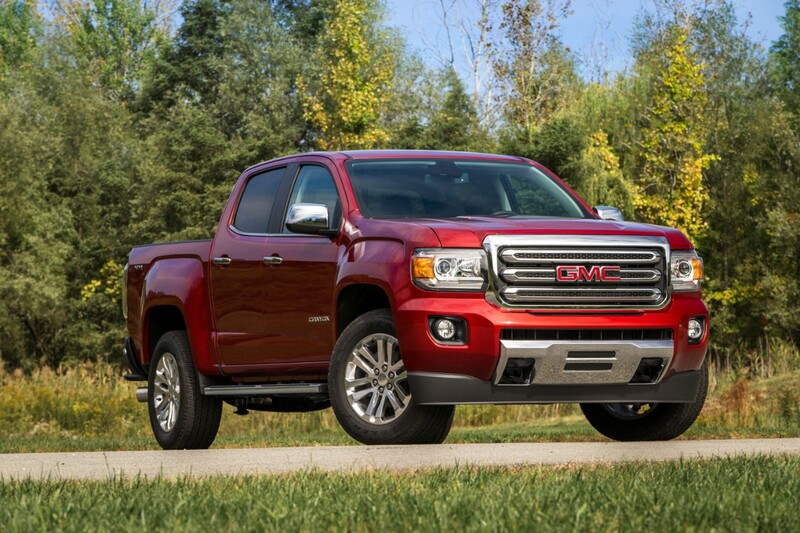 A top of the line GMC Canyon would be a great truck to represent the brand, and if you are looking for a midsize pickup, would be a fine representative in your own driveway. Front Head Room: 41.4 In. Front Hip Room: 55.0 In. Front Leg Room: 45.0 In. Front Shoulder Room: 57.5 In. Rear Hip Room: 53.3 In. Rear Head Room: 38.3 In. Rear Leg Room: 35.8 In. Rear Shoulder Room: 56.2 In.